Firework and thunderstorm season is upon us and boy, did it sneak up on us this year! If you are anything like us here at The Pet Beastro, you are wondering how it became summer all of a sudden. I know every year we chat, blog, and discuss pet anxiety, especially when it comes to fireworks and a bunch of other summer situations where your dog’s nerves get frayed. Because every dog is unique, we like to look at each dog individually to help them and meet each pet where they are at with their anxiety. Here is a great question that was posed to me just recently: Which should I use for my dog, Distress Remedy (also known as Five Flower Remedy or Rescue Remedy by Bach) OR an herbal supplement? This can be a loaded question, depending on your pet and how they are reacting during an anxious period. This is my two cents on both of these supplements - they are BOTH great but both should be used in different manners. The Distress Remedy from Nature’s Sunshine works more with the emotional plane. Often times, our anxiety gets the best of us and then we begin to make up scenarios in our mind that then make us more anxious. I love the Distress Remedy because everyone (and I’m talking about us humans here, too) can also take this remedy. Anyone who has an anxious dog can probably attest to a time or two where their dog’s anxiety in return made them anxious. When we become anxious our pets feed on that anxiety, making everyone in the situation uneasy. 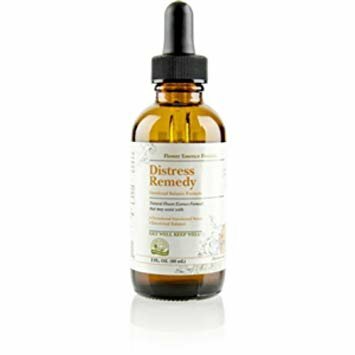 I often recommend the Distress Remedy over the Rescue Remedy since it is a blend of seven flowers over the five flowers that are in Rescue Remedy. I also like flower remedies because you can use them as often as needed which may be as frequently as every five minutes during an acute crisis with no ill effect. Distress Remedy promotes presence and awareness in traumatic situations, eases stress, and helps to balance when one feels emotionally “off”. The Distress Remedy is also easy to travel with since storms and fireworks can be unexpected during travel or camping season. Herbal supplements are also great products but are often used more for the physical approach of trauma and what trauma does to the inside of the body. Many times when we stay in a state of anxiety for long periods of time, we can cause stress physically on the body which may include frayed nerves, lessened gut flora, reduced amino acid of GABA, and a flood of stress hormones. When we are in a stressed state, the body tends to use up these reserves making one more jumpy and reactive to stress and anxiety when it comes around. There are many herbs that can help calm the nervous system to help us better react to these anxiety periods. Nervine herbs that are most commonly used for pets include catnip, feverfew, passion flower, skullcap, valerian, wood betony, chamomile, and oat straw. You can see how picking one over the other might be a tough decision. To be frank, in most situations I would use both. Bringing the body into balance needs to happen on all planes - mental, physical, and emotional - for the body to be in a healthy state. There are also several additional options to help overall anxiety with pets. These include essential fatty acids, cell salts, essential oils, and positive affirmations to help your pet recover and begin to balance. Some pets are anxious in situations that don’t include storms or fireworks. The supplements recommended can be used for any state of stress and anxiety. Unfortunately, what works for one pet might not work for the next. If you are unsure of where to start, any of our staff members can guide you with a few quick questions after we learn about how your pet reacts to anxiety and stressful situations.